Our regular readers may recall that I scouted the Gambia in late 2017. I had experienced it as a friendly and ‘birdy’ country where a casual atmosphere provided to those who enjoy walking about and watching for (amazing) bird life on foot that very opportunity. So, it was with great excitement that I set out to the Gambia again in November 2018, this time with a group of Quest travellers on our inaugural tour. It was an experience that delivered much of what I expected, as well as many surprising and uplifting moments. First, for the expected. Based on my previous scouting trip, I knew we’d observe a variety of fine birds, many quite beautiful, that typify bird life in Tropical Africa. On that note, I would say we were highly successful, notably as far as showy families were concerned. 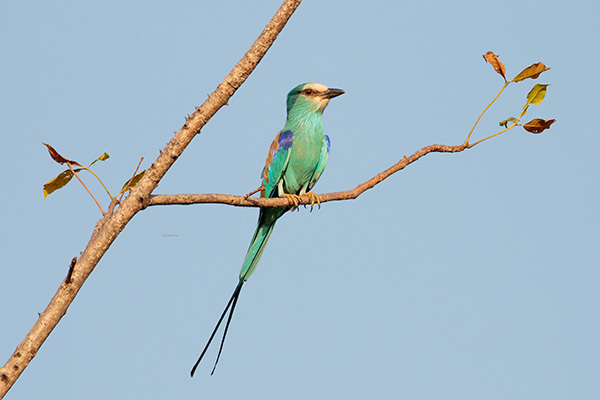 Bee-eaters, kingfishers, rollers and sunbirds are some of the most pleasing to the eye, and we had chances to see many members of these groups well. What’s more, even those fellow travellers alleging very modest photographic experience had opportunities to photograph some of these birds and to take home as memories. It can be a challenge in a faraway place to get multiple photographic opportunities of the same bird but in this little country, many of the showiest birds are ubiquitous, so one can get multiple opportunities to see them. 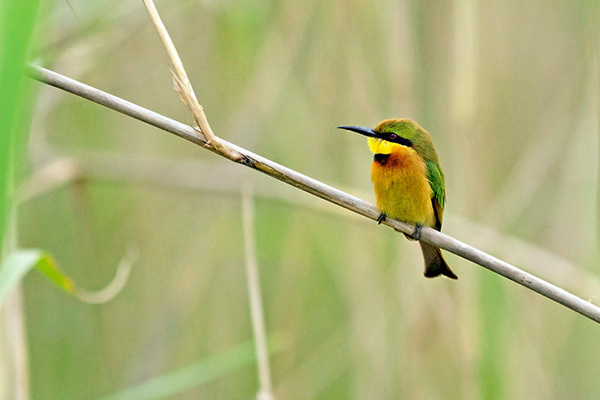 This Little Bee-eater was one of several we saw well. It’s a fantastic photographic subject! Some of the less widespread birds were a treat to see as well, for while they can be quite localized, they can still be fairly predictable in the right spots. I dare say we were all excited to see the lovely Egyptian Plover, which can be found in good numbers in just such locations! A few Egyptian Plovers coursing the waterline. Another thing that I was expecting was that we’d enjoy a variety of different habitats and get a sense of the subtleties of the land. Such subtleties are, for example, visible along the length of the River Gambia, the large waterway that defines this country and that is subject to the tides on the Atlantic Ocean; for example, the upper reaches are devoid of mangroves that typify the lower reaches, but still subject to the forces of ocean tides despite being hundreds of kilometres inland! We enjoyed the nuances of the river as we set out on a boat ride one fine morning at high tide! Besides the river itself, we also got a sense of the seasons. Many birds begin nesting late in the year after the end of the rainy season and as temperatures cool, and on this stretch of river, we particularly enjoyed the sight of magnificent vultures and Marabou Storks building their nests in trees high above the banks. 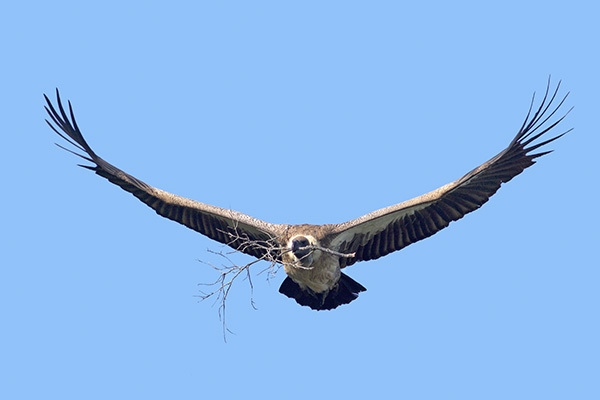 A White-backed Vulture with 2-metre wingspan carries a branch to its nest. 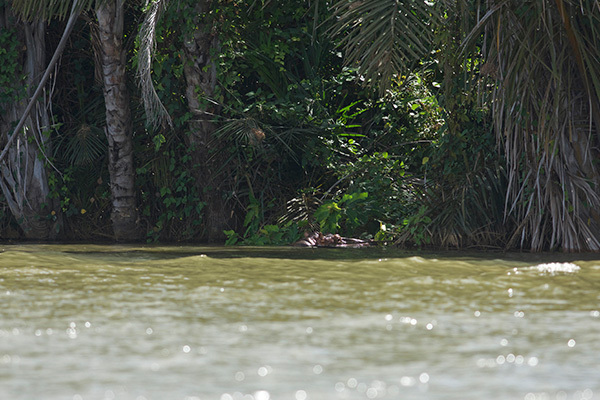 We were also privy to something I was not quite expecting… Hippos live in the upper reaches of the River Gambia but historical persecution here has made them wary, so they remain in the water during the day and only go onto land at night. If one is to be seen during the day, it’s at low tide. I had failed to see a Hippopotamus during my 2017 trip – what a nice treat for us all therefore to see one at all, and at high tide! The animal occasionally went underwater and then resurfaced, and its loud exhalations were reminiscent of a whale’s blows; such were their intensity. A Hippopotamus resting inconspicuously along the riverbank. 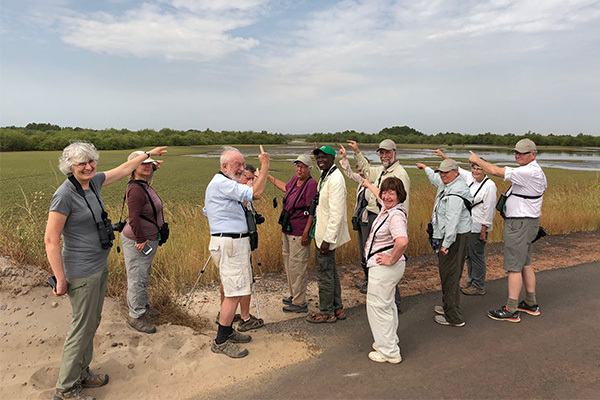 Perhaps the most fortuitous happening took place during the second half of the tour as we travelled westward along the North Bank of the River Gambia. We were to spend one night at a lodge near the town of Farafenni. Apparently, a neighbouring village had received word of our impending visit at the lodge. At the request of the local Member of Parliament (the Honourable Dembo K.M. Camara), we were urged to go to this village where no outside visitors had gone previously in recent memory. It was some kilometres from the main highway down a dirt road, and suddenly we were at the village, with two long lines of children –one the boys, the other the girls– all smartly dressed in school uniforms, awaiting us. It turned out we were the guests of honour at a reception! After being greeted by the children, the school master and Mr. Camara told us about the town folk’s aspirations, and we were then treated to a musical performance by some of the village women in what I think our travellers would describe as nothing less than a spectacle…some of us even joined the dancing! (not I though, I was recording it on video!). Our friendship with Mr. Camara would be cemented the next day during another fortuitous event. He had decided that he would follow us in his car on our way westward to reach our final lodge. He was interested that we took such an interest in the country’s bird life and natural environments. En route, we made a quick stop at a roadside wetland to have a look at the birds we could see from the road. We lingered perhaps longer than I had planned. Even though we had seen the things we had stopped for, persistence in our continued searching resulted in something rather unexpected as one of our members spotted large unidentified dark birds at a distance. It turned out that we were watching five spectacular Black Crowned Cranes at the edge of the mangroves! 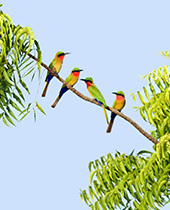 They were distant but afforded acceptable views, especially since they are at best a sporadic sighting in the Gambia. What turned out to be a routine stop resulted in a cause for happiness. Our group points to the location of the distant Black Crowned Cranes. 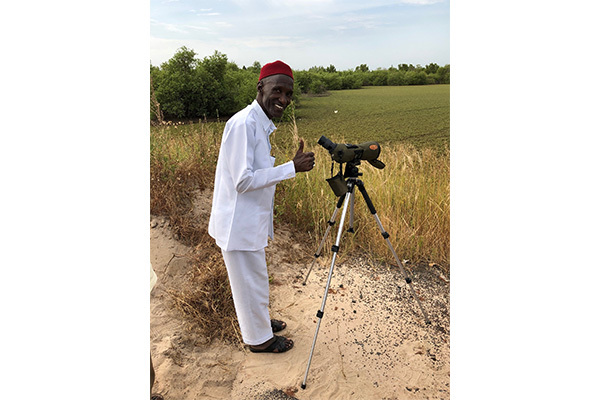 What’s more, we had the privilege of pointing out these birds to Mr. Camara, who, like us, had never before seen these birds but for whom the whole idea of looking for wildlife in this way was novel. The Honourable Dembo K.M. Camara, watched the cranes through my spotting scope. He was delighted to become aware of these uncommon birds. 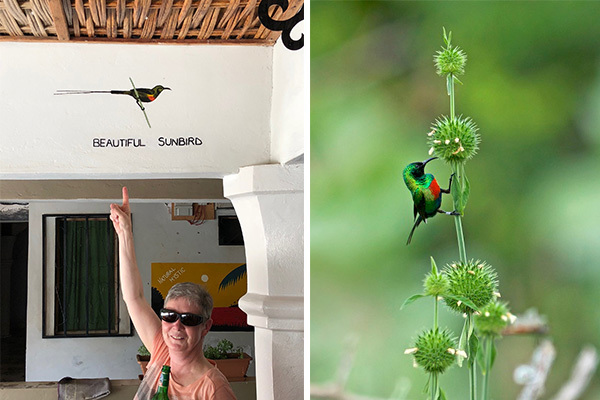 In the end, we collectively observed 235+ bird species and enjoyed the variety and surprising richness of this tiny little country and a shared experience of discovery. 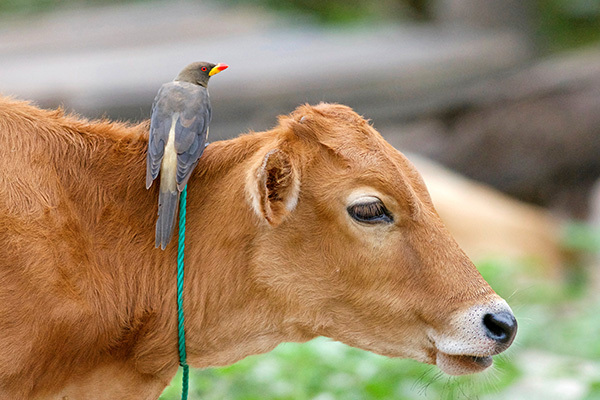 cattle were often enough attended by a Yellow-billed Oxpecker or two! 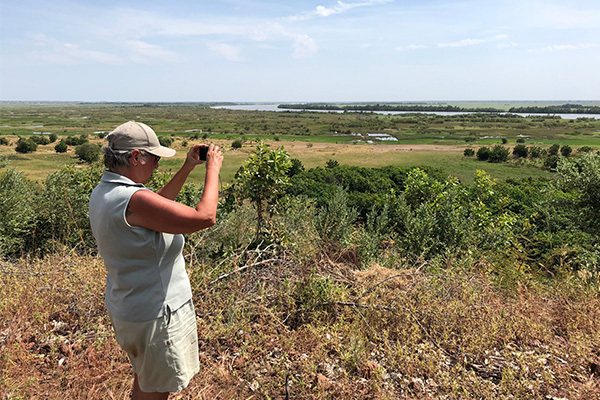 Enjoying the view on a high bluff overlooking the River Gambia. 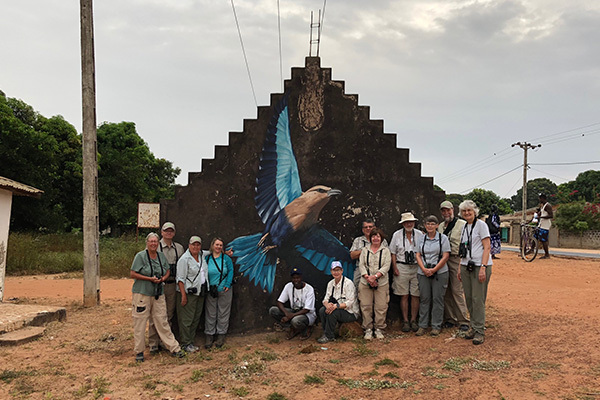 Our group posing in front of a Blue-bellied Roller mural. This tiny country is what I thought it would be: a great introduction to Africa for those who had never been there, as well as a welcome new dimension for those who had travelled elsewhere on the continent previously. We look forward to returning to the Gambia in November 2020. Will you join us?